I am so excited to share that Maria Chubb and Karina Lepkowski mastered educators teaching at Most Holy Trinity within the Archdiocese of Detroit Catholic Schools will be coming to share their best practices they have been sharing at Detroit area EdCamps and Archdiocese of Detroit professional development sessions on March 3rd for our Archdiocese of Baltimore and Loyola University “Harness the Power Within” Professional Development Day! Last week while sitting in an airport, I grabbed a magazine that featured information on Microsoft’s HoloLens. As an educational leader, I was simply blown away with the future classroom applications that could occur once this product’s engineers have worked out all the kinks and the price driven down to make it an affordable tool to use to enhance learning for learners of all ages, in school and in the workforce. Below are some good reviews to get one acquainted with the product and provides a glimpse of what it can do and why this product is one to watch for making a change in the way we look at teaching and student learning. The 2016 Must Read Education and Technology Blogs by Ed TECH Focus on K-12. Educational Technology and Mobile Learning website is very cool and offers a plethora for resources for educational leaders. The site offers blogs to follow and products to use to enhance any learning environment. Since we should always be learning new ways to perfect our craft, regardless of industry, this is a great site for professional development and human resource leaders as well. Learning needs to be engaging for all learners, regardless of their age or level of education. SnackNation, conducted a survey and came up with some out-of-the-box blogs that share ideas on how to make your employees feel validated and engaged in whatever it is you as a manager, leader or employer have to offer. In an age where after a 30 second sound bite, we lose interest, gleaning some perspective and new ideas from those with whom we want to engage, so they can lead our industries into tomorrow might not be a bad idea. Great Leadership -A blog for a leader/manager at any level. This blog also shared best practices and tools to use with your team. e.g. Individual Performance Plans etc. Strategic Human Capital Management A useful resource for an HR manager or leader in any industry. 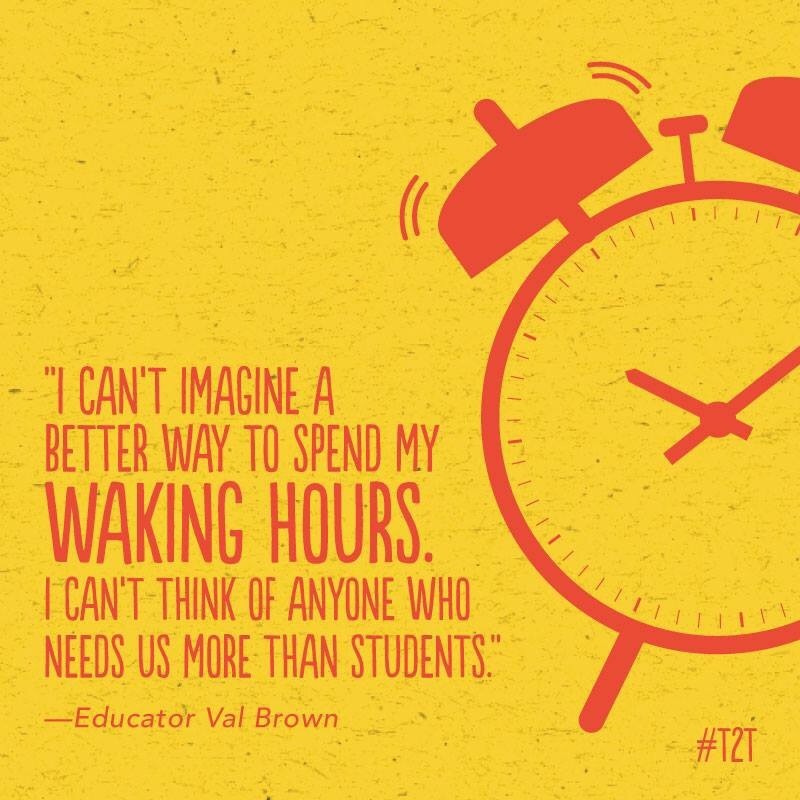 When after working 21 years within the world of education, I pause to reflect and review the amazing opportunities I have had, hopefully making a difference in the lives of students, faculty, staff and school communities I have had the pleasure of developing programs, serving, and training. Given the relocation plans, many in my life are surprised by my excitement about the adventure and all the uncertainty that relocating can bring. Many have taken the time to voice their amazement on how well my children are taking to the news and quite honestly surprised by their excitement. Our family have spent time talking about the responses from family and friends. I have had numerous conversations on the topic of relocating with my educational leadership peers, faculty and staff. Ultimately, I am thrilled to join my husband Michael. I am grateful for the grace of life and having two healthy children. In education, I have spent years teaching and encouraging students to embrace change as a new concept or topic of learning is being taught. I have spent years developing programs and training and encouraging educational teams to include my own faculty and staff, to change the lens in which they see their classrooms, teams and school environments, and embrace a new idea and or theory all for the betterment of enhancing the learning experience of the students placed in their care. These experiences have all been successful and repeated throughout the world by many. In education, we are called to be change agents, and yet so often, we have a difficult time stepping out of our silos and changing the lens in which we use to see the world around us. As I embrace this new chapter in my life, I am excited as I interview within education, various industry leaders and agencies, I am seeing just how small (and global) our world is. I cannot wait to see which team I will join and grateful for the wonderful years of working within the world of education in Michigan. I encourage all those who play a role in the life of a child to continue to encourage them to seek out the new, embrace the changes as opportunities and help them see global connections all around them. I will continue to post blog entries on those topics I find most interesting and educationally worthy. I am grateful for all the feedback and the hundreds of thousands of views this blog has received. My next blog post will be on Microsoft’s HoloLens. I have recently read a few articles on this product. You can say you read it here first, when I say that this product will change the way in which we teach and learn in the future. As you know, educational changes often move as pond water, and we may not see this product changing education best practices tomorrow or even in the next 5 years but this is an amazing product and it is definitely one to watch when it comes to enhancing education for our leaders of tomorrow. I have been offered and accepted a position as Assistant Principal at St. Regis School in Bloomfield Twp, Michigan. It is a wonderful school and I am thrilled to work in an environment where education is paramount! I am excited to join an educational team where the educators embrace technology and differential learning. I will continue to hold my seat on the Birmingham Public Schools Education Council, where I enjoy discussing curriculum and collaborating with educational leaders and parents in the local area. My position as CEO at Unlock the Teacher will not change, as we continue to write and develop training for students and teachers. Trisha, Sue and I will continue to write and plan out new academic eBooks (we are working on three right now) and Sue will continue to create amazing graphics for our clients and produce fabulous commercials. 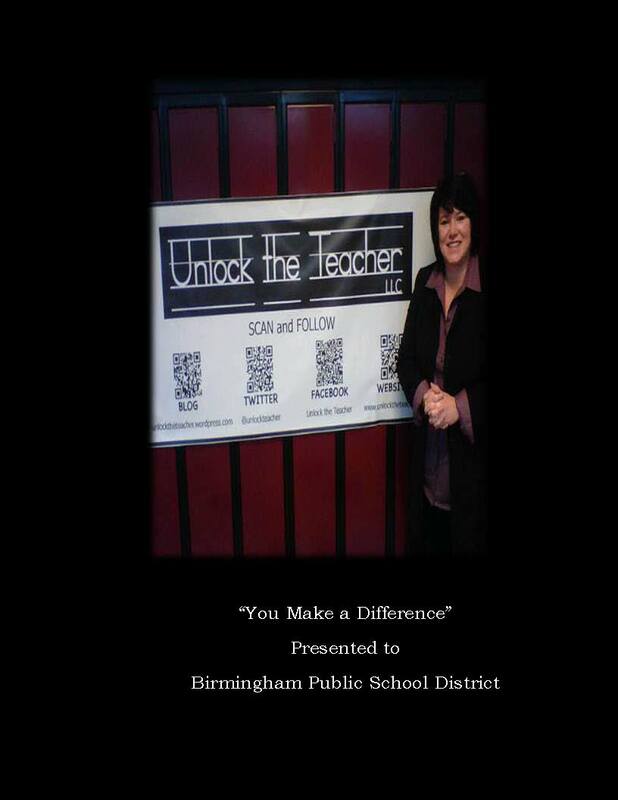 Our next professional development for educators is in January for one of the BPS Public Schools, topic is “You Make a Difference”. We are thrilled to announce, that we have completed our 15 month process of writing book I in our series for teachers and parents with Dr. David Lick, MD, Beaumont Hospitals and Dr. Joslen Letscher, Ph.D, University of Detroit Mercy professor. The parent and educator sample group blessed off on our draft and the graphics are AMAZING! We will be sending our proposal out to agents and publishers alike the first week of January before we head to the Writer’s Digest Writing Conference 2012 in New York, Jan. 21-23. We enjoy this conference for the collaboration that occurs among writers of all genres and the education obtained in the workshops are so beneficial. 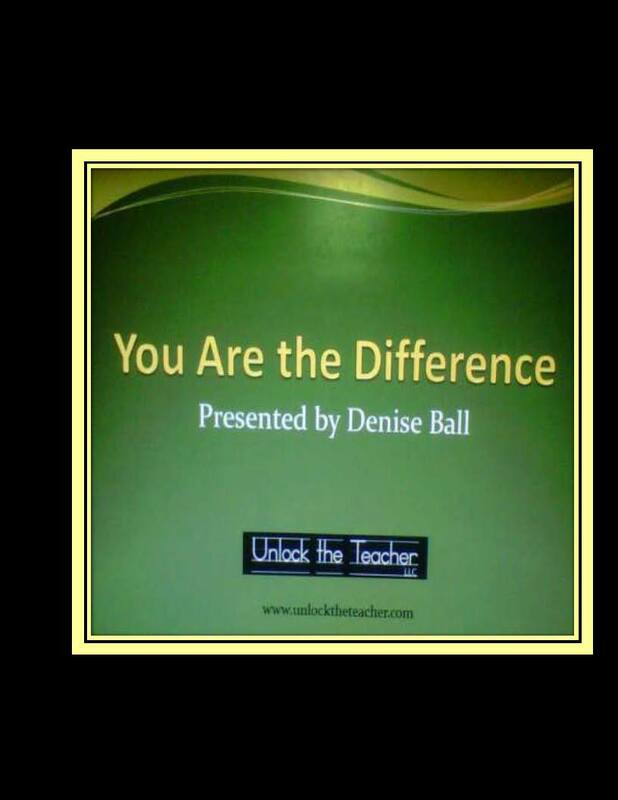 We would love to share the good happening in your school, please let us know at denise@unlocktheteacherllc.com. Wow, what a long week of trying to figure out why someone would manipulate our system, to take over our blog. However, once we figured out the who…all it took was effort. We want to thank Google Security and the WordPress team for working so diligently on our behalf and in such a professional manner. We realize that our logo has been modified as well as many lost articles. We will get our blog back into shape and appreciate your patience. Give us a few days to repair and we have some exciting articles to share with you on utilizing Google in education and some great educational conferences coming! For all of the well wishes this past week, knowing that someone had hacked our blog, we thank you from the bottom of our hearts! Our goal is to be a beacon of light and to help make a difference for children, parents and teachers. How would your organization utilize $500,000 to give back to the community? Unlock the Teacher LLC would utilize money in urban schools across U.S. by providing Writing ePublishing Workshops for students grs. 6-12. We teach students and their parents how to utilize their gifts and talents to create eBooks to earn and save college money for their future. Please visit Chase Community Giving FB page and “like” our comment, if you like our idea.